Not long ago, radio manufacturers had only to worry about the basic look of their devices. Rarely were new stations added, reception methods hadn’t changed in a long time and, generally, smaller was better. Sure, they had to combine an alarm clock in some models, but that wasn’t too difficult. Now a radio has to be a veritable Swiss army knife of appliances, and this is where the new Sensia from Pure excels. Its list of features includes a large color touch screen display, DAB, FM stereo and digital radio with full Band III, wireless media streaming, input from iPods/iPhones and MP3 players, and Pure Apps that let you connect with Facebook, Twitter, Picasa and thousands of podcasts. The Sensia is a nice-looking device but it's certainly not tiny, with a big 64k color, 640 x 480 5.7-inch TFT touch screen that has an interface similar to an iPod. The built-in twin 3-inch drivers deliver 30W total output and there’s a 3.5mm headphone socket for private listening. 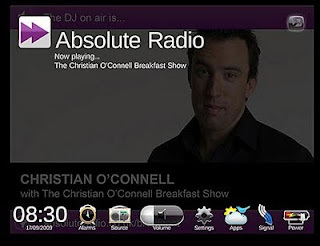 If there’s nothing on the radio that takes your fancy (you're hard to please), just connect your own device via the mini USB or stream music wirelessly (802.11b/g) from your PC (streaming requires UPnP server or PC/MAC running UPnP server software which is supplied on registration to www.thelounge.com). Media streaming supports WMA (Standard V9), WAV, AAC, MP3, MP2, Real Audio (cook). Station slide shows provide artwork on the unit's display or album covers are shown if you’re streaming. It’s easy to save stations as favorites by clicking on the heart icon on the menu. All favorites are stored in one location - tap on a favorite to get it playing and watch it in full screen or in the window. The Pure Lounge portal gives registered users access to more than 10,000 radio stations. And there are a lots of ways to find your favorite stations. You can Quick Jump, if you know the name of your station, or type it in using the touch screen qwerty keyboard. Use the search engine to find a station by genre, country or language. Or search by stream quality – only listen to stations with the best quality reception. Catch up with on-demand content with the ‘listen again’ feature. Simpply choose the program you want and the episode you desire and tap ‘listen again’. You can access thousands of podcasts and listen to them without having to first download them to your PC or MP3 player. There's also a library of Pure sounds (nature, etc) which are great for drifting off to sleep. Sensia has a number of useful alarms, including sleep timer and kitchen timer. You can choose what music you wake up to and there’s a snooze alarm when you just can’t get out of bed first time. The Settings menu changes the display and allows software upgrades, of which Pure says there will be regular new Apps apart from the ones the Sensia comes with. And for those people who like to look but don’t touch, there’s a remote control. If you find you can't confine the Sensia to the bedroom, the optional in-unit rechargeable battery pack keeps the unit operational for up to 10 hours of portable listening. The Sensia, by Pure, will be available from Amazon UK at the end of October for about GBP£250 (USD$400).